Previewed at: Dendy Opera Quays, Sydney, on 29 July 2015. The latest National Theatre Live production about to be beamed into a cinema near you is an adaptation of the 15th century morality play Everyman, whose original author is unknown. It is considered to be a cornerstone of English drama and, like its NT Live predecessors, it’s a treat that should not be missed. Directed by Rufus Norris, the current Artistic Director of the National Theatre, and reworked by the Poet Laureate Carol Ann Duffy, this version is a contemporary update of the play. The term ‘everyman’ is acknowledged as being the definition of an ordinary individual with whom everyone can identify and who often finds himself caught up in strange circumstances. This very watchable, energetic production takes a scathing look at materialism and is a grim reminder of our own mortality. 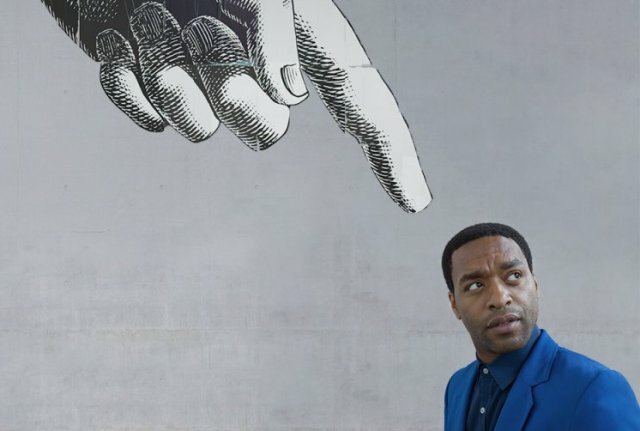 It sticks to the premise of the original, in which Everyman (Chiwetel Ejiofor) is about to meet his Maker, having had an encounter with Death (Dermot Crowley). He tries in vain to enlist a member of his family or one of his friends to support him in his time of need, only to discover that, in the end, he must face his reckoning alone. Some of the play’s characters are defined as Senses and Wits, identified by categories such as Vanity, Strength, Smell, Sensuality, Sight, Touch, Taste, Conscience, and so on, but they’re all as hedonistic as Everyman, who’s deeply embedded in the material world. The opening scene is a raucous romp as they all gather at a party to celebrate Everyman’s 40th birthday and partake in an orgiastic, coke-snorting binge, beautifully illustrated by Javier De Frutos’ inventive choreography. Ejiofor’s performance is terrific as he achingly confronts his mortality. He is ably supported by the rest of the cast, particularly Kate Duchêne as God / Good Deeds, in the guise of a world-weary cleaning woman, and the aforementioned Dermot Crowley, who plays Death as a rather menacing Irishman. Everyman endeavours to progress from ignorance to knowledge and, along the way, find spiritual enlightenment, but it’s a case of too little, too late. As the end draws nearer and the foibles of his existence mount up, Everyman is faced with the question of whether it is only as we approach death that we can begin to understand life. In this age of the selfie-obsessed, Facebook generation, Everyman makes for a sobering reflection on the true value of life. Not surprisingly, there was thunderous applause when the lights went up at the play’s end but it may’ve been relief that the audience didn’t have to face this ultimate test themselves just yet. Go and see this fine production and judge for yourself.